Me: Uncle Sam, thanks so much for this interview. It’s an honor for me to speak with you. As a child growing up in Washington, D.C. I saw images of you everywhere and was very curious to learn more about you. Uncle Sam: It’s a pleasure to talk with you Robert. As I’m sure you know, there are all sorts of stories about how I originated – everything from an early 19th Century meat packer in Troy, New York to a lyric in a late 18th Century version of Yankee Doodle. The truth is that I’m an iconic figure that represents the United States government and to speak of specific origins doesn’t make a lot of sense. I morph as the our country morphs. Me: Well, that’s been a lot of morphing. Does that have anything to do with deciding to take Alexander Technique lessons? 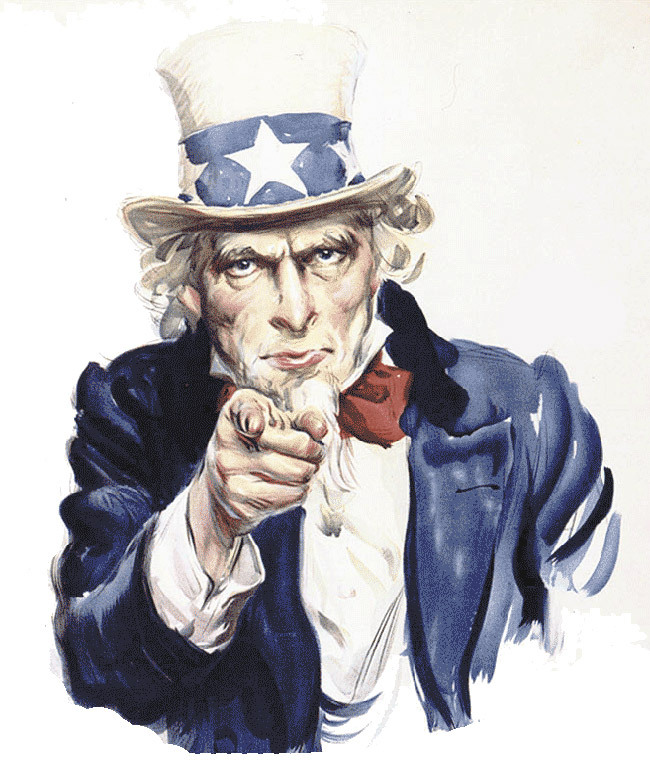 Uncle Sam: Yes, that and the fact that in recent wars I’ve become associated with military readiness, and that’s created a whole new set of challenges for me. Me: Could you say more about those challenges? Uncle Sam: Well being ready for action takes it’s toll on the body. I found myself becoming stiff with tension, always anticipating the next threat to our nation. Terrorism has been particularly difficult for me to handle because it can come from anywhere, any time, and from inside and outside America. Me: How did your Alexander lessons help you with that? Uncle Sam: My teacher used the analogy of a cat stalking a mouse. The cat is incredibly still, hardly a muscle moving, and he watches the mouse and is ready to pounce at exactly the right time. The cat doesn’t tense up. My teacher showed me, using her hands as guidance, how I could be vigilant without being tense. More vigilant in fact. And she showed me I could train myself in this skill. Me: So that makes you a more effective guardian of our country with less wear and tear on you. Uncle Sam: Precisely. And for that I’m extremely grateful to the Technique, to my Alexander Technique teacher and to F. Matthias Alexander who came up with the basic ideas of the Technique. Me: You mentioned your longer term role morphing to match changes in our country and that the Technique helped with that as well. Uncle Sam: Yes, well being able to change – to adapt – to a constantly changing country requires a good deal of mental and physical flexibility. You can’t afford to become complacent with just one identify. And the development of that kind of flexibility seems to just come with lessons in the Technique. I’m no expert, but I assume it’s related to the loss of habitual harmful physical tension. Me: Well you’ve certainly demonstrated that ability to change as times change. And I’m glad the Alexander Technique is helping you do that. Thank you again for taking the time talk with me. I’ll be sure to post this interview on our country’s birthday. Uncle Sam: You’re very welcome Robert. I wish you an enjoyable Fourth of July! I like the analogy of a cat who is ready to pounce but not tense. I grew up in Canada and wonder who you could interview there?? Sargent Preston of the Yukon?